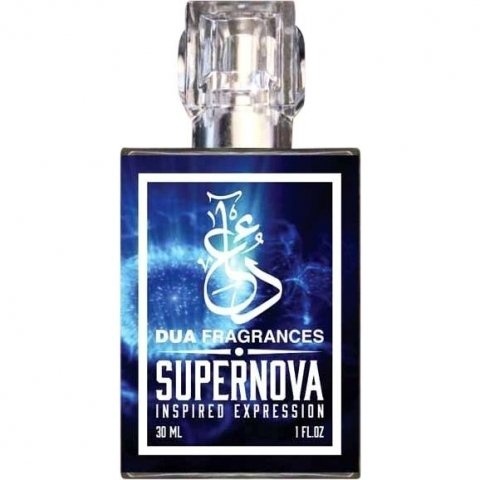 Supernova is a new perfume by Dua Fragrances for women and men and was released in 2018. The scent is fruity-citrusy. It is still in production. There are days when you can't see the forest for the trees. That's the way it goes for me, with all the new fragrances coming on the market. Often it is only a small ray of hope, but it disappears quickly and the tested fragrance, unfortunately, does not make it on the list. This led me to test some overseas fragrances. During my research I came across Dua Fragrances. Without further ado I decided to order some fragrances. Supernova was the first fragrance that made it into my shopping cart. What was I curious when the delivery arrived. Duas interpretation of Roja Parfums Elysium is a mix of Cologne and Eau de Parfum. Aromatic juniper berries from cologne and the vanilla infused leather chord of the perfume should create supernova. The start is kept very citric by the grapefruit, lime and bergamot. A certain flower mix of rose and jasmine paired with some pepper and apple form the centre. Towards the end vanilla and labdanum provide a sweetness that completes the fragrance beautifully. For me Supernova is my personal highlight 2018. Durability is good and the projection is a good average. A good and cheap mix-dupe from Roja Elysium Cologne and the Eau de Parfum. For lovers of Aventus and Sauvage, certainly also a test value. Fruity summer dream - love on the first spray? Admittedly - some Roja are very interesting just because of their presentation and marketing. But the one I copied here already had me at the fragrance pyramid. A wild mix of fruity notes paired with an exquisite selection of various fruit components. There are also - especially in the top note - some citric accents. Other components can also be clearly seen - but the fruity notes are the most important here. The first time I wore it sparingly dosed in the office. He accompanied me beautifully throughout the whole working day and in the right summer climate he comes into his own. A colleague has asked me that she finally knows where this good smell comes from, because she has been trying for hours to locate the scent. But now I come to the actual story which convinced me completely of this scent. Arriving at home in the evening I made myself comfortable in the living room. Suddenly I noticed a fragrance that was no longer letting go of me. In the beginning I could not assign this pleasant smell and read on in my book. But at some point the curiosity was too great and when I arrived in the bathroom I knew immediately where it came from. It was this one spray I put on the collar of my t-shirt. I can't believe how beautiful this fragrance comes across when it's in the air! The Sillage is clearly perceptible in the first hours. Afterwards it withdraws continuously, but remains perceptible for a good 8-9 hours. Also in my apartment it was perceptible by this one spray on the collar of the T-shirt for days and that, although I stayed some rooms away. The association with Aventus cannot be dismissed. He also reminds me of Aventus. This means that they go in a similar direction, but they are different on closer inspection. "Supernova is the brief, bright glow of a massive star at the end of its lifetime due to an aventus-like explosion." Write the first Review for Supernova!